The Ekam Yoga studio is located on Main Street in downtown Bozeman, Montana. The main studio is located on the third floor and can be accessed by the staircase at the front of the building. Our studio has been custom-designed with the student in mind. Our practice space is heated for optimal muscle warmth to promote flexibility (but don't worry, it's not too hot). Amenities? Yep, we've got those: from towel service to free wifi, we've got you covered because if you're here, you're family. From fully stocked showers to top-of-the-line amenities, we've got you covered with the things you need to get on with your day. Stash your gear during class, we offer storage hooks and benches in the lobby. Looking for a spa-like experience for your taste buds? We're proud to offer fruit-infused waters on tap. We offer a variety of traditional props for your use during class at Ekam; we also have some of our favorite items available for sale. We believe in community, especially within the wellness world. That’s why we joined forces with (in our humble opinion) the best studios in town. Our partner studios, Zephyr Cycling and Pure Barre, offer workouts that will absolutely complement your practice. If you have an annual membership at any of our three studios, you receive 15% off any class pass at either or both of the other two. Additionally, you can purchase a Trio Pass, which includes 5 classes at each studio with an expiration date of two months, from any of the three studios. Email us at info@ekamyogamt.com for more information. 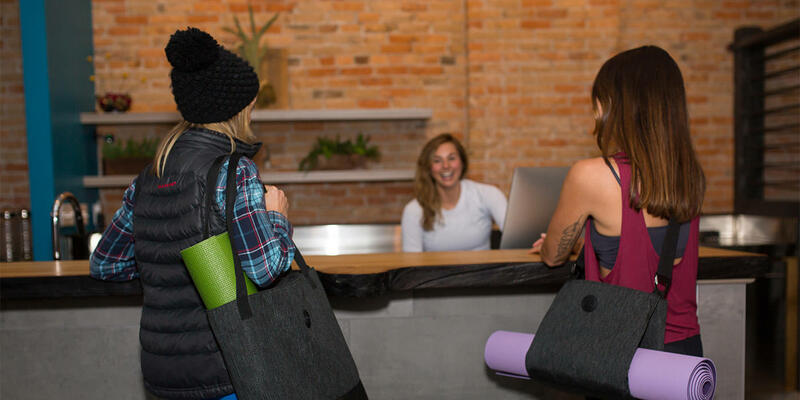 Ekam Yoga is located in downtown Bozeman at 9 East Main Street, Suite F (third floor). You'll find us in the same building as Sassy Sisters, Main Street Overeasy, and Windemere Real Estate. There is free 2-hour parking on Main street, or you can park in the Bridger Park Garage, which offers easy parking with the first 2 hours free.